Just shy of a year after acquiring rotating concept shop Story, Macy’s is finally pulling back the curtain. On Wednesday, the department store chain opened its first Story at Macy’s, a shop-in-shop with the rotating theme and sponsorship approach that Story first pioneered eight years ago. The shop, which is on average 1,500 square feet, exists in 36 Macy’s stores across the country. Rachel Shechtman, founder of Story and brand experience officer at Macy’s, says that while the new approach may seem similar to the original Story shop in Chelsea, it will be a different experience for consumers under the Macy’s umbrella. “This is not about taking what we did downtown and plopping it into Macy’s,” she says. “It shares a name and idea in that it’s narrative-driven retail with merchandise and event programming, but everything about this was created with other people.” Shechtman spent the last five months working with 270 dedicated staffers who were trained in a “Know + Tell” specialized program. Macy’s purchase last year of Story has been lauded by retail experts as a smart move in the marketer’s efforts to regain consumer interest in its 161-year-old brand. Along with the rotating shop, Macy’s is investing in other initiatives such as the Market, a pop-up marketplace with both up-and-coming and established brands. On a recent earnings call, Macy’s CEO and Chairman Jeff Gennette spoke about the high expectations for Story. “We’re excited about the potential of this new concept in Macy’s,” he said. In the fourth quarter, Macy’s reported a comparable store sales increase of 2 percent, though net sales fell 2 percent to $8.5 billion compared with the year-earlier period. 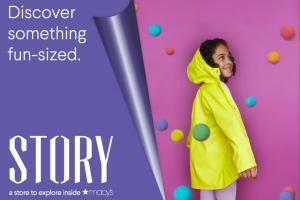 Running through June, Story at Macy’s’ first theme will be “Color.” Its sponsors are Crayola, Levi’s Kids and MAC Cosmetics. Macy's did not disclose financial terms of the sponsorships. MAC, a longtime seller at Macy’s, plans to test new ideas and incorporate consumer feedback on future endeavors. Crayola is a first-time partner of Macy’s, Shechtman says. The brands plan to host events at the stores, including a “Crayoligraphy” hand lettering workshop, on a bi-weekly basis. Shops will switch out themes roughly six times per year. Most of the shops have merchandise from around 70 vendors. But the Herald Square shop, at 7,500 square feet, will have 110 vendors and serve as Story's flagship. The brand is relocating from its standalone Chelsea location to the larger space, located on the department store’s ground floor. “It was the right decision to relocate to Herald Square—the right decision for Story at Macy’s,” says Shechtman, noting the foot traffic and exposure of the location, a magnet for New York City tourists. To market the new offerings, Macy’s worked with branding agency Sagmeister & Walsh, which ran Story’s original branding in 2011. BBDO, which is Macy’s agency of record, was not involved. A new color-centric campaign will run on digital and out-of-home channels. Macy’s will also promote Story at Macy’s in the windows of key properties including Herald Square, Michigan Avenue in Chicago and Union Square in San Francisco.